We were scheduled to go ashore today, and had planned to drive a rental car down to Pu’uhonua o Honaunau – Place of Refuge. Unfortunately the tendering process takes far too long this morning because of choppy seas, so we cancel our plans and stay on board the ship. 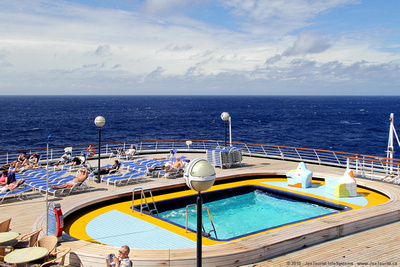 I go for a swim in the Sea View Pool in the stern, which is very nice – a salt water pool with very few people around. We have lunch in the Lido, which is the only restaurant open when the ship is in port. I have Indonesian chicken on rice, which was spiced just right. I listen to an e-book while reclining on the Promenade Deck, and take a few photos of the tenders and the Kailua-Kona shoreline. We depart on time and sail around the Big Island to see the volcanic flow off the coast by Kilauea, however no lava was visible this evening. I’m glad I had such good success seeing the lava flow last October when I visited the Big Island and the Kilauea Volcano. Linguini Fruitti di Marein the Canaletto restaurant, aboard VolendamWe dine at the Canaletto Italian restaurant again this evening. The pasta is simply superb. 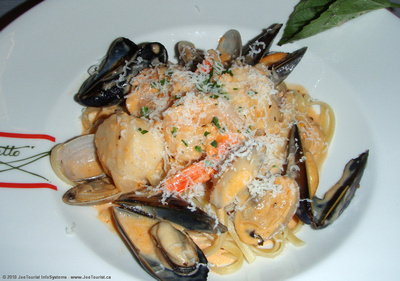 I have the Linguini Fruitti di Mare (seafood linguini) which was mostly seafood and excellent. For dessert, I have my favourite: Three flavour Tiramisu (espresso, lemon & Amaretto). We all agree we are going to be so shocked when we return home – when we have to prepare our own meals and clean up after ourselves! This entry was posted in Hawaii, USA and tagged cruise, cruise ship, island, restaurant. Bookmark the permalink.